You can walk (or ride) the Oregon Trail, Mormon Trail, and California Trail over South Pass to this day. The South Pass Trail driving tour takes you through some of the first towns to settle in Wind River Country. Be sure to have your camera ready and your hiking boots strapped up tight- you are going to want to get out of the car and explore! 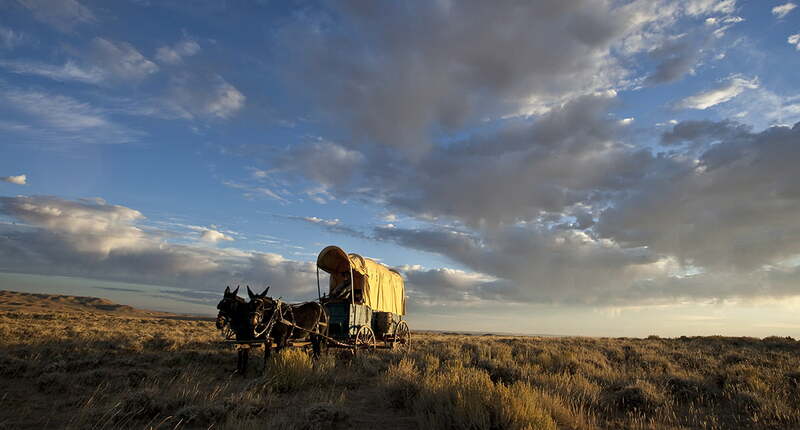 In 1856, two Mormon handcart companies left Nebraska in late July for the Salt Lake Valley. Their departure date was too late in the year and both the Willie and Martin Handcart Companies encountered severe winter weather in October. With few provisions and little shelter, the companies lost close to 200 people to exposure and illness. The Willie Company was near Rocky Ridge when help from Salt Lake City finally arrived. Although a mass grave of 13 people is marked by the Willie’s grave monument 7 miles outside Atlantic City, people in the company died over a period of days along the trail, during and after the storm. The Martin Company was near Devil’s Gate when the storm hit and also suffered many deaths despite the efforts of rescuers. The company took shelter in a cove, now called Martin’s Cove, which can be visited today. The tragedy of this snowstorm was the largest disaster to occur on the Oregon-Mormon Trail. See the Sweetwater Trail for more information. The full-day tour starts in Atlantic City, an authentic mining town at almost 8,000 feet that today serves as a rustic getaway for tourists. Atlantic City, approximately 2 miles off of Hwy. 28 on a gravel road, offers restaurants and accommodations. It is 3 miles from South Pass City, home to one of the West’s most impressive historic sites. You’ll travel on remote gravel roads, so please read our travel safety tips before leaving. If you are adventuresome, before you head to South Pass, take a detour at the south end of town and head southeast on County Road #512 to Willie’s Handcart Monument. Follow #512 for 3.7 miles until you reach Lewiston Road. Take a left on Lewiston for 3.5 miles to Rock Creek; the monument is on the right. The monument commemorates the tragedy of a Mormon group that suffered severe hardships and death in 1856. At this site you will see the ruts of the Oregon-Mormon Trail. 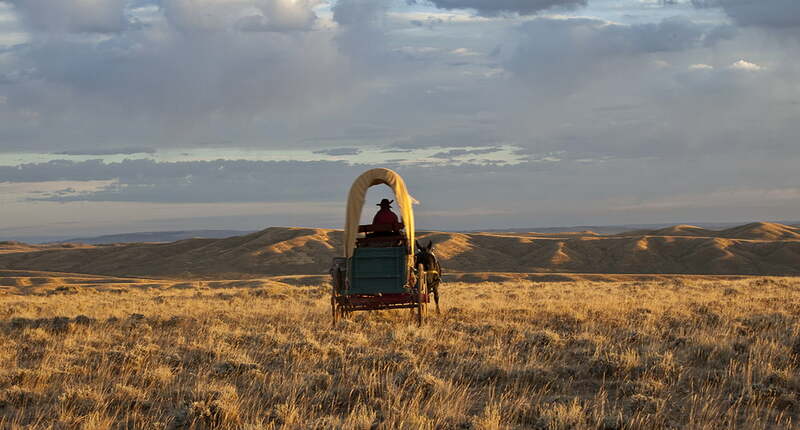 Wind River Country is one of the few places where deep ruts from the wheels of thousands of wagons and handcarts can still be seen today. A quick look around gives visitors an understanding of the sights the emigrants encountered day after day while climbing towards the Continental Divide at 7,412′. Follow the same roads back to Atlantic City and turn left toward South Pass City when you hit the main gravel road. At the South Pass City State Historic Site, you’ll feel as though you’ve stepped back 100 years. Visit the 27 renovated historic buildings and see more than 30,000 original artifacts from the gold rush days. The site is open from 9 – 5:30 during the summer. Admission is $1 per adult. On the hill south of the historic site sits the town’s cemetery. Visitors are welcome to tour the cemetery and asked to respect the memories of some of the town’s first occupants. Back down in South Pass City, head out of town the way you came in, but take a left turn just outside the town, past the old Carissa Mine, and head up the hill roughly 3 miles to Hwy. 28 instead of returning to Atlantic City. At Hwy. 28, turn left and travel south 10 miles until you cross the Sweetwater River just after the South Pass Rest Area. On the other side of the bridge, you’ll see another dirt road on your left marked Oregon Buttes Road, County Road 446. Driving down this road 2.8 miles brings you to a marker and instructions to the true Continental Divide and South Pass Summit on a dirt, two-track road. 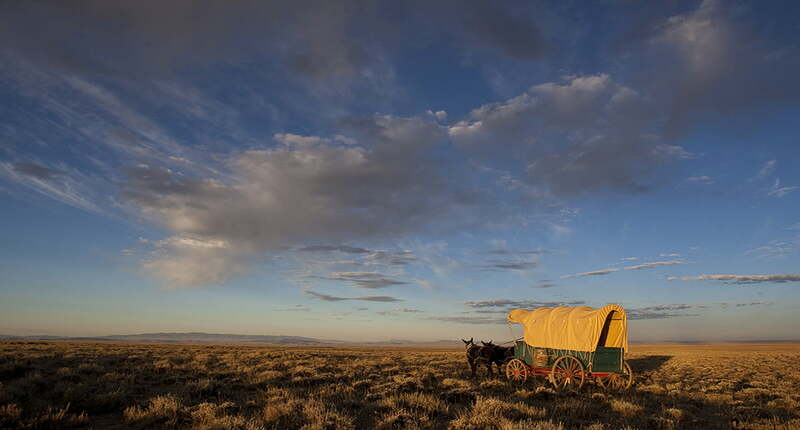 You will be on the most pristine sections of the Oregon-Mormon Trail. To get to the South Pass Overlook, where excellent interpretive signs describe the challenges of the emigrants, return to Hwy. 28 and head south again, for 4.3 miles.As you return to Atlantic City for some real Western atmosphere at the local establishments, enjoy the views of the impressive Wind River Range on your left. Look for antelope, deer, moose and eagles.